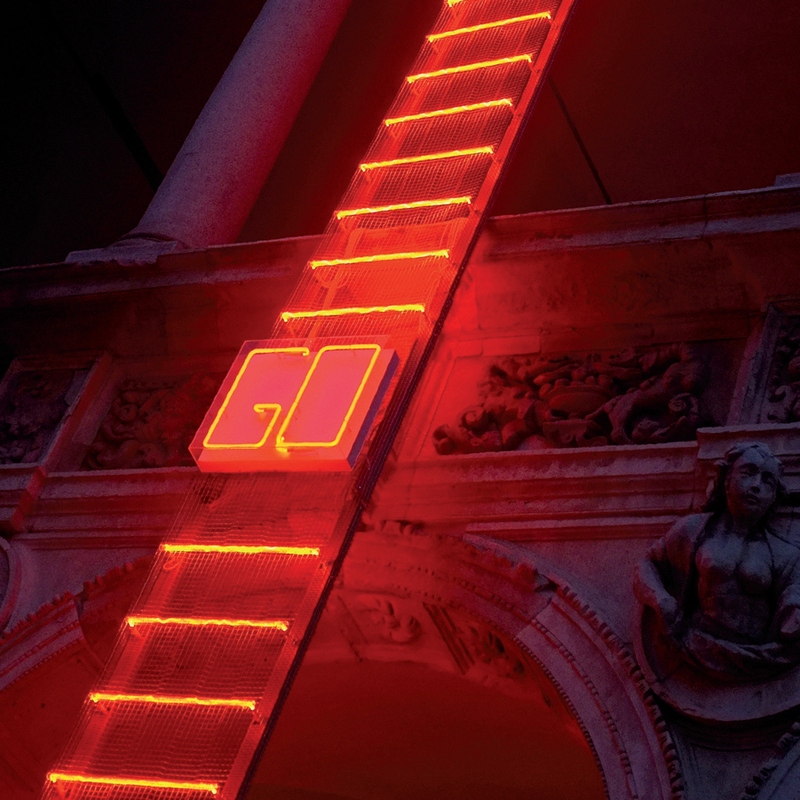 The GO-UP ladder, 2013, with its red neon steps always in motion, is an installation that hints at an emblematic climb. The horizon at the top is so wide that the ladder used to ascend it is rendered useless, while words become Wittgensteinishly superfluous. Go-Up is an invitation to continue along the path of inward growth and knowledge. A ladder with red neon rungs is the formal, existential and poetic metaphor of an artist who has made the luminous sign, the beauty of form and the minimalism of structure her aesthetic idiosyncrasy. In Federica Marangoni’s ideational and creative journey this minimal linear structure, with its red, white and blue rungs, is a topos, a symbol, a formal and conceptual metaphor. All artists develop their own visionary archive, from which their characteristic forms, signs, signals, colours, inscriptions and alphabets originate and express their Weltanschauung. Contained in Federica Marangoni’s archive are the linearity of her Luminous Thread as an emblem of continuity, the symbolic vitality of red, the energy potential of the spool, the imprint of her hands in glass, alongside neon wordings of denouncement or tolerance. Her use of glass, both in the mega-installations and in her phantasmagorical pool of design objects, enhances the aesthetic solution, innovative technico-structural choices, and emotional intensity of her message.